“John, I would like to thank you and your staff for a fantastic experience during my recent treatment. As you know, I have been a practicing dentist for the past 26 years. During this time, I have developed many close relationships with former classmates and colleagues. I also know that during the past 25+ years, I am able to recognize what quality dentistry is. “When I decided to replace my veneers, I knew many options were available to me. Being a dentist, I knew who to ask and I knew what to ask when deciding who I would allow to treat me. While I may have driven past 200 dentists on my two hour drive to your office (realize that is not an exaggerated number in the N.Y./N.J. area) I do not think I would have received the same level of care elsewhere. “I am so happy that I made this investment in myself and I am so happy to have landed in your office.” – Robert J. Cambria, D.M.D. “Due to some poor dental care in my youth, I had to have a good number of my upper teeth pulled back in the 1960’s. So at the age of 19, before I even met my husband, I had to start wearing an upper denture. I got used to it over the years but it was always in the back of my mind that I’d like to get rid of it someday. “Now my husband and I have been retired for 15 years. We live and travel fulltime all over North America in our RV, so finding good doctors and dentistys can be a challenge. Since New Jersey used to be home my sister in law suggested we park the RV for a few months and go see her dentist Dr. Noveck. She had been using him for years and spoke very highly of him. “Recently on our way north from Florida I lost a filling in my front tooth. That was the impetus I needed so when we reached New Jersey I called Dr. Noveck’s office and made an appointment. “From my very first visit I knew I had made a good choice. Every member of the staff, from the first person I met, the receptionist Debbie, on up to Dr. Noveck, was very friendly and welcoming. It felt like I’d been a patient for years. “When I explained my lifestyle and added that I had always wanted to be rid of the denture but that kind of work didn’t seem to fit in to my schedule, Dr. Noveck was not even rattled. He invited me back in a week and said he could draw up a couple of plans. True to his word when I returned a week later Dr. Noveck was armed with two comprehensive plans for me to choose from and both included getting rid of my antique denture. That was in April. As the work progressed it only got better and better. Dr. Noveck was always aware of my limited time schedule and he always seemed to be one step ahead of the game in modifying and executing what needed to be done. He is highly skilled, meticulous and extremely artistically talented at what he does. He is supported by a pleasant, down to earth, professional staff. “The best part of my story is that in June on my 67th birthday I walked out of Dr. Noveck’s office with my old denture in a plastic baggie and my new smile on my face. For the first time ever my husband of 46 years saw me without a denture. He was almost as happy as I was. I am so pleased with the work Dr. Noveck did. I’m still amazed at how and what he managed to accomplish in the time frame. He definitely puts his patients welfare first. “And most of all I finally have that smile I should have had when I was 21 years old! “I used to be a dull guy…or at least my teeth and smile were. Then a close friend suggested I speak with Dr. Nosti. I was impressed from the initial consultation. Dr. Nosti explained in detail what he could do for my smile, how the procedure would be done, and how much it would cost. Once the decision was made, Dr. Nosti and his capable staff at Advanced Cosmetic and General Dentistry made the experience as painless and pleasant as possible. Because I traveled a long distance to get to the dental office, over an hour one-way, the staff worked hard to make sure the appointments fit into my busy schedule…they even saw me over the weekend. “The results were remarkable. My teeth and smile are perfect. I cannot believe the before and after pictures. I never imagined the difference would be so significant. I am confident in my appearance and no longer avoid smiling when someone wants to take a picture. Thank you, Dr. Nosti!” – Mark S.
“Dear Dr. Noveck and Staff: Well after many, many sessions at your office, my entire smile and confidence level about it has now been completely restored! As you know, I am in the people business and image is important. Now when I speak in public or in general, I focus purely on the message, and not the appearance of my mouth. What a great feeling that is! My sincerest appreciation to you, Doc, for being so patient during my reconstruction. In addition to your gentle and kind approach, you were always open to my questions and calmed my fears along the way. Better yet, the team initiative that you have formed with Neil Zachs, makes you the best kept secret in South Jersey. You can be certain that I refer anyone who asks about the ‘smile’ directly to you. Having said all of this, please accept my sincere thanks. Of course, Pat, Lisa and Terry are keepers, too! “I was recently experiencing a painful and annoying condition and I did not know why. My teeth were starting to get very sensitive. My upper and lower molars were beginning to wear down and my lower molars were even starting to really hurt when chewing food and gum. My current dentist would constantly scold me for grinding my teeth. He even made me a plastic mouthpiece to wear at nighttime to prevent me from grinding my teeth. But this did not solve the problem, and only gave me more grief and discomfort. Although he is a very nice guy, my current dentist was unaware of the real problem at hand and did not seem willing or able to resolve it as the condition of my teeth got worse. I needed help and a second opinion. After a brief online search this past summer, I recently discovered Dr. Noveck and the outstanding team at the office of Advanced Cosmetic and General Dentistry in Somers Point, NJ. What an amazing discovery this has been. “Ever since I can remember, my smile was something that I had always been self-conscious about, and it reflected in pictures I had taken or social situations I was in. A friend of mine referred me to Dr. Nosti because she knew how unhappy I was with my smile and she told me he was the doctor I needed to see. “When I was younger, I had surgery and braces to correct my bite. I was told that my smile would be something to be proud of when the braces where off, however, I was very disappointed with the outcome. Knowing what I had already been through Dr. Nosti took the time to explain my options and told me I could see my smile on models before we started. Even after he showed me my smile, I was still apprehensive and waited several months before starting treatment due to my previous fears. “I first went to Dr. Nosti’s office to discuss the appearance of my teeth. I had seen some smiles he had transformed and was hoping he could do the same for me. After my first exam it became quickly obvious that Dr. Nosti was not the average dentist. He asked me questions about my teeth and did an exam unlike any dentist had done before. He suspected I suffered from headaches before I could even tell him. “After several appointments Dr. Nosti came up with a plan that would give me the new smile I wanted, take care of the chewing problems that I had, and get rid of my headaches. “I’ve been a patient of Dr. Noveck’s office for roughly 25 years. Every time I went for a cleaning, Dr. Noveck and the staff were concerned about my teeth and suggested I get them fixed. About 18 months ago, I decided it was time. After the prep work, I was nervous about being in the ‘chair’ for such a long period of time, fearing that I would experience pain and be uncomfortable. When I arrived for my appointment, my fears disappeared. The staff was awesome! Everyone was very accommodating, and I experienced no pain whatsoever! The compliments are still coming, and I smile more because I am not self-conscious any longer and I feel better about myself. I look at the before and after pictures and wonder why I didn’t have this done sooner.” – K. G.
“On my first visit to the office, I was very nervous since many dentists in the past had told me veneers would be too much work and too expensive. They would not even discuss options with me. It is very humiliating to be in this position. Pat was the first person I met at Advanced Cosmetic and General Dentistry, and she was so welcoming and pleasant. Right off the bat she let me know that she and Terry had both been with Dr. Noveck for more than 15 years and all their patients are like family. “I had been wanting to have cosmetic dentistry performed since before my late husband, also a dentist, passed away, but kept putting it off. Subsequently, I was recommended to Dr. Milton Noveck, whose office staff put one at ease immediately. “Dr. Noveck explained the entire procedure and what I could expect in terms of discomfort (almost non-existent) and the time schedule from visit #1 to completion of the work. I actually looked forward to my visits, which is most unusual as I am not the bravest of patients. The end results surpassed even my expectations, as family and friends raved about my final look. I can’t thank Dr. Noveck and staff enough, and my personal recommendations would be at the highest level.” – B. K.
“Dr. Noveck spoke to me many times over the past few years about fixing my front upper teeth. Two of my teeth were capped and they were nowhere close to the color of my other teeth and they were over 25 years old. In February 2004, I finally gave in and had my front six teeth fixed with veneers. What a difference! My teeth are finally all the same color and they feel great. Many of my friends and family have commented on how I smile more than I did before and how great my smile now looks. Thanks, Dr. Noveck for keeping after me about this, and for the terrific job you did! “The past few years I have been wearing a bite plate at night to help alleviate the grinding of my teeth. During one of my bi-annual checkups, the dental hygienist mentioned the wear on my teeth and that they were rapidly wearing down. During the check-up with Dr. Noveck I was asked if I had headaches, although I didn’t have headaches, I always woke up with congestion in my head, like a sinus infection. Another symptom I suffered was not getting a full night’s sleep. I woke up intermittently throughout the night. Dr. Noveck’s recommendation was a tech-scan procedure that would eliminate the bite guard at night and help reduce the wear on my teeth. “After consideration, I decided to go ahead and have the procedure performed. At my appointment I didn’t really know what to expect. Immediately it was determined by Dr. Noveck that I would need an occlusal adjustment. “Before becoming Dr. Noveck’s patient, I had been going to a local dentist for many years. I was always nervous about going to the dentist since I had a bad experience with a specific novacaine as a child. My old dentist who did lots of dental work on me always made fun of the fact that I was so nervous. I would also hear him making sarcastic remarks about his other patients. Well, I had quite a lot of work done by my old dentist and the last bridge was located in the front and very visible. He did a terrible job. The bridge looked horrible and so fake looking! The fit was not good and the color was not what I chose and even though I was not satisfied and had spent lots of money with his office over the years, he did not care and wouldn’t even correct the fit. “I had issues with my teeth and gums ever since I can remember. I tried never to show my teeth when I smiled. I have to tell you that has changed dramatically. I now wonder if I am smiling too much, just to show off the beautiful smile I have now, thanks to you. You gave me so many choices as to what I could do, and offered your advice when asked. I spent many many hours in your office and must say that I was always treated so well, made comfortable and you always explained what the next step was and how we would be proceeding. “I started asking people if they knew any dentists in our area that were capable of complete smile makeovers or reconstruction-type dental work. The more I asked around, the more I kept hearing about Dr. Noveck. I made an appointment and I am so grateful and so thrilled that I did. From the minute I arrived in Dr. Noveck’s office I knew I made the right choice. The staff was very warm and friendly. Dr. Noveck listened to all of my concerns and spent a lot of time with me explaining what needed to be done. He also showed me many before-and-after pictures of patients whom he has treated. 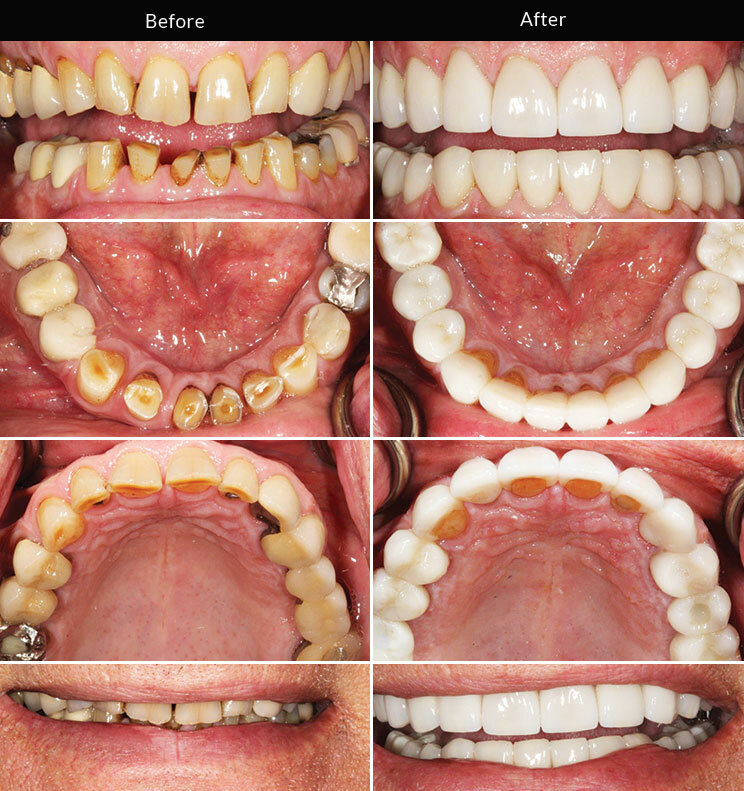 “I completed treatment of all my upper teeth several months ago. I am so happy. I love how it all looks and I can’t stop smiling. Everybody tells me how great I look and that I look younger. When my husband Steve saw what Dr. Noveck did for me, he decided he wanted to fix his teeth also. His teeth had worn down over the years and became very short and he was not happy with his smile either. “I have been a patient of Dr. Noveck for about five years. Last year, I decided to have cosmetic and reconstructive work performed that was long overdue. I could write volumes, but the fact is Dr. Noveck is a true perfectionist. I would not have trusted the work to any other dentist. I am satisfied to the point of being amazed. My wife and friends all share the same reaction.